At Fine Framers, nothing gives us greater pleasure than framing items that hold happy memories for people. 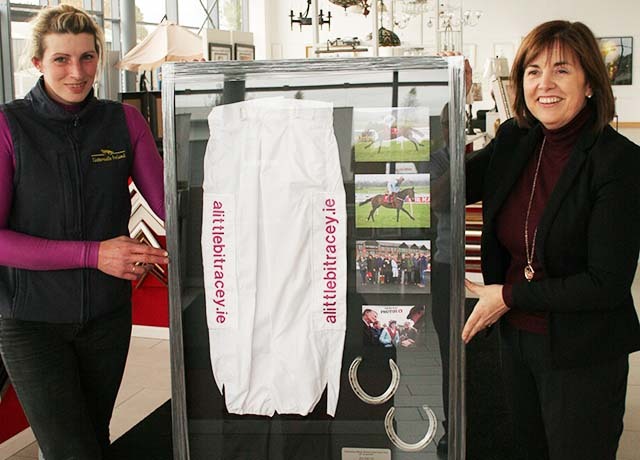 We were recently able to do this for a horse lover who had one of the great experiences of her life earlier this year, when she rode the horse Daisy’s Gift into a second place finish at the Punchestown Festival. Trudie Smith achieved that feat in the Punchestown Kidney Research Fund Charity Race, where she was second of 24 entries. It was particularly meaningful for her as she had developed a strong bond with the horse over a number of years working with it in the yard of Ireland’s top trainer, Willie Mullins. To get the chance to partner it in such a big event was an occasion in itself, and to finish so well made it even better. Trudie came to us with her racing silks from the day, along with some horseshoes and photos. We gave them our hallmark attention that all sports jersey framing projects get, as we laid the items out attractively in a large display and framed them using our expert techniques. The racing silks, photos, and horseshoes are fully protected from moisture and other damaging elements in the frame, so they will remain in perfect condition for many years to come. If you too have a jersey or other sports item you would like to have framed, just contact us for expert advice and service. We can help make your memories last forever too!